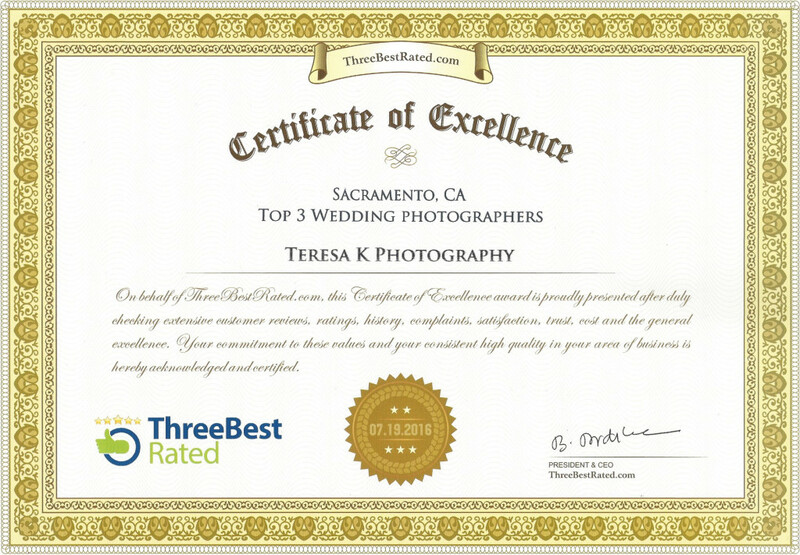 Three Best Rated - Wedding photography in Sacramento - Sacramento Wedding Photographers | Teresa K photography Facebook Twitter Instagram Pinterest Client's Area Search this site. I received this pleasant surprise in the mail recently. Thank you Three Best Rated for the recognition! And thank you to my clients for taking the time to get the word out about their experiences with Teresa K photography!! You deserve only the best in life. Our website Three Best Rated® was created with a simple goal to find you the top three local businesses per category in your city. Our employees Handpick Top 3 local businesses per category in your city. We check business’s reviews, history, complaints, ratings, satisfaction, trust, cost and their general excellence. We display only businesses that are verified by our employees. You can call it “Due Diligence.” or “Common Sense.” We call it “Hard Work.” Our website is updated on a regular basis for quality and latest business information. Three Best Rated makes it easy for you to find the best businesses in your city along with their complete contact information. We display all information we have including Name, Email, Phone and Website URL right on our website. We do not hide any business information from you. We DO NOT require you to sign up for anything to get the information. You DO NOT have to pay us to get the information. You just contact the business directly and do business with them, we don’t come in the middle any time. We do not sell your information to any business. For Businesses, It is free and they DO NOT pay us to list them ever. We prefer to list good and best local businesses and not big corporations who have an office presence in your city. We believe that local businesses provide much better and personal services than corporations to you and your family. Local businesses know your city better since they live there too. Our policy is free to list because if you can pay to list, then is it really the best business?